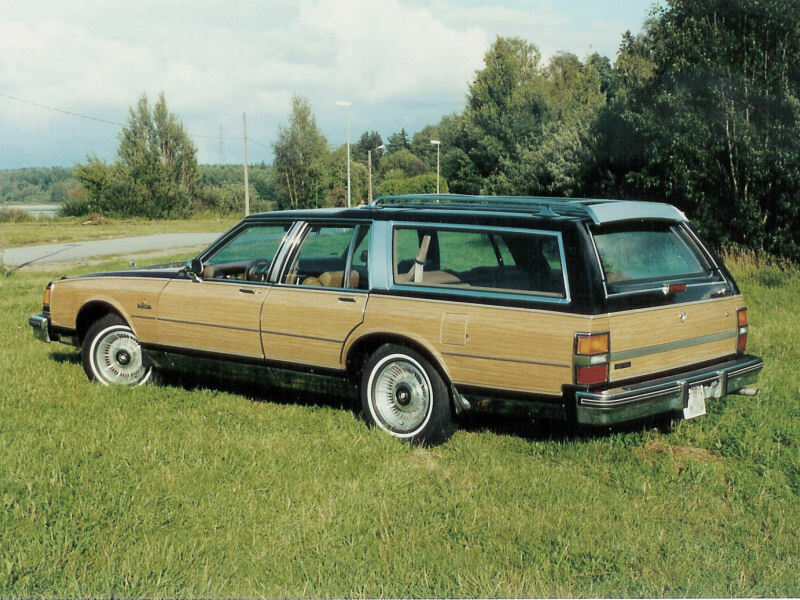 It was now spring of 1993 and I wanted a full size station wagon for around-the-year use. It was clear that couldn't be anything but a GM product. I didn't want a Ford and Chrysler didn't have any of later models. Since my preferences are with Mopar I didn't want to go as far as a Chevy so there were only Olds, Pontiac or Buick left. I found this Buick with a 307 cu. in. 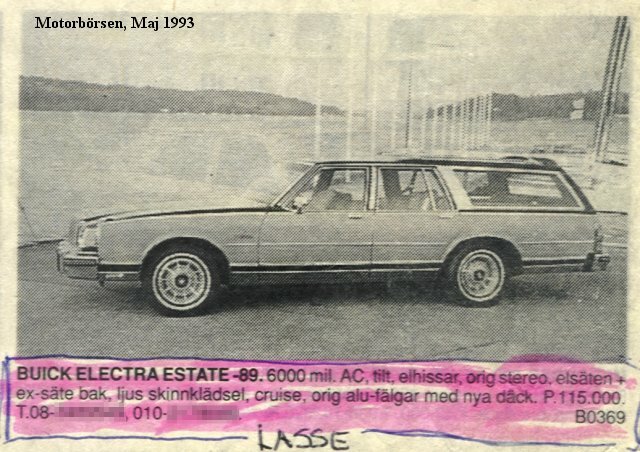 (5.0L) in an admagazine in May of -93. 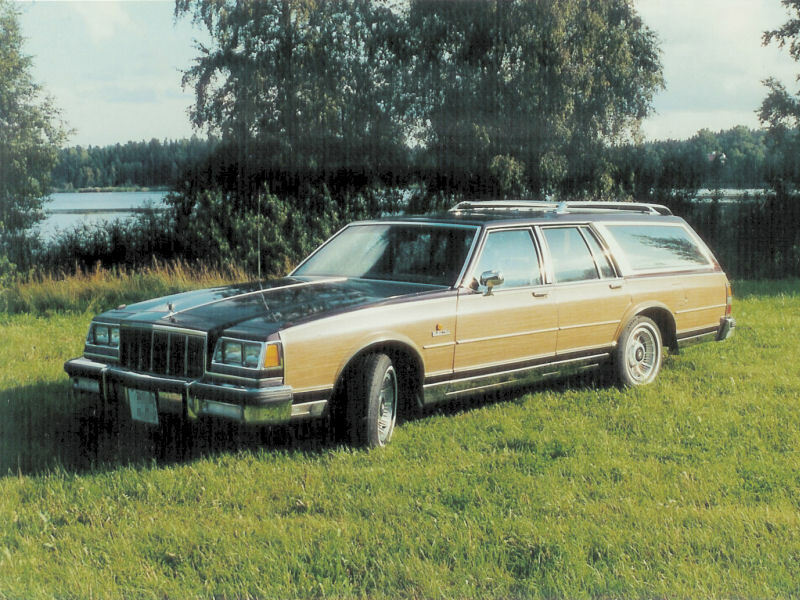 It had just been imported from Florida and had not been driven in Sweden. It was seriously converted to Swedish regulations i.e. the speedometer/odometer had been replaced to one with km/h and km readings and the rear lights had been replaced by Euro versions with orange turn signals. Most times imported cars just get an overlay for the speedometer and leaving the odometer in miles. The turnsignals, which have to be orange, are usually fixed by an add-on light mounted on top of the rear lights or even on the bumper which really doesn't look very good. The ad said 60.000 km but since the meter was replaced it couldn't be verified and my guess is at least 15.000 km more judging by some of the supplied documents. I have had the following major faults during these 12 years: alternator replaced twice, the gasket between intake manifold and engine block replaced twice due to coolant leak, transmission overhauled due to metal residues in the pan at an oil change and radiator replaced. Another thing that didn't have to happen was that an aluminum tubing for the AC had been mounted so close to a pointed bolt at the front fender that the bolt finally made a hole in the tube. Amazingly both the original exhaust system and the battery made it through 12 years before they had to be replaced in 2001. The ad from the magazine. The pictures probably from 1993 or 1994. Eventually everything comes to an end and on May 10, 2008 I sold it.